This might be one of my most favourite episodes of The Make Light Show. My friend Kate Inglis lives the kind of life you imagine all talented writers of fantastical children’s books live: in an old sea captain’s house on a wild, windy coast with a history of rumrunners. And that’s where Kate joins me to today, as we talk about unspeakable loss, and creating a life afterwards that is filled with beauty, and resilience and most of all, self-compassion. So grab a cuppa (if it’s filled with rum, we won’t tell), and join us. Click here or the arrow below to listen. Enjoy, friends. 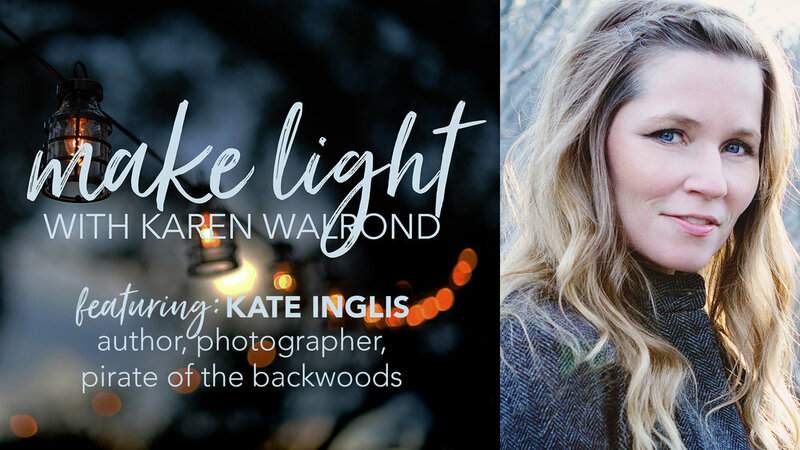 As always, if you'd like to learn more about Kate and her beautiful work, be sure to click here to check out the show notes. And please, don't forget to subscribe on iTunes, Android, or wherever you listen to your podcasts -- and if you're enjoying the show, be sure to leave a review!